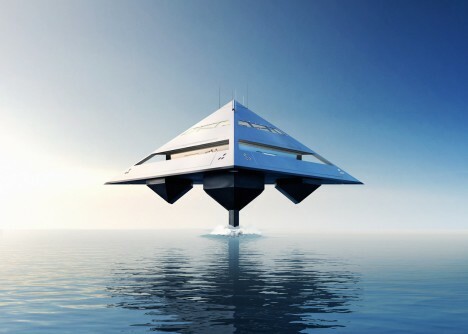 Pyramidal and otherworldly in its shape, this concept yacht is not as impossible as it appears, seeming to lift almost entirely off the water in the design renderings by Jonathan Schwinge. 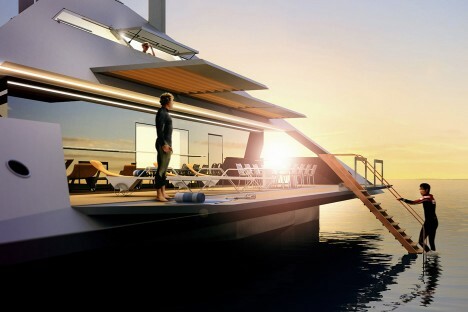 More than just an aesthetic ideal, the resulting experience would be faster and smoother for passengers. 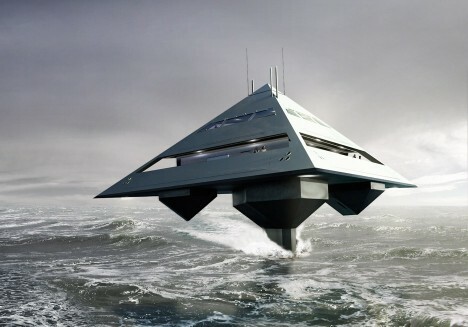 The Tetra yacht (short for tetrahedron), uses foils for lift, it begins from the water as it increases speed, ultimately reducing drag from the surface and allowing the vessel to cruise faster, then setting back down on its main hull when stopped or slowed. A narrow strut is dropped as the vehicle lifts, then retracted as it comes down. From an engineering standpoint, the design does not require new technologies, just dynamic redeployment of existing structural approaches, transforming to each configuration of use. See more in Concept Vehicles or under Transportation. March, 2016.